The Pistoia Alliance App Strategy is getting quite close to releasing its first public-facing result. Phase 1 of the strategy involves deploying a catalog, which serves as a community-focused collection of curated apps that are designed for use in life sciences R&D. The snapshot on the right shows two portals into the app catalog: the top part shows apps that are applicable to an iPad, and the bttom part for an Android-based device. The software that we are using to deploy the service is provided by AirWatch, a company that specialises in mobile device management software. We have been eagerly awaiting version 6.3 of their platform, because it allows us to offer the service to the public, by leaving out the relatively intrusive device management capabilities, which are legally encumbered, and which we don’t need for phase 1. We don’t have an exact release date for the app catalog, but it looks like it will be soon. The latest version of the hosting software is almost ready for production use, and we are doing a bit more fine tuning and testing. If you happen to be the creator of a chemistry app that is listed on the iTunes AppStore or Google Play, and it would be accurate to describe it as being directly relevant to life sciences R&D, then you should definitely consider submitting your app, which you can do now, using the submission link. It doesn’t cost anything, and we don’t care whether your app is free or non-free, because at the moment it has to be already listed on the platform’s company store, which takes care of such details. The only major requirement is that we expect you to sign up as a user, and keep an eye on user feedback. If users post lots of comments and questions, and never get any response, we’ll pull your app out of the list. Having your app listed is, for the moment, having it added to what is essentially a collection of links, a bit of metadata, and a place where other users can post comments. 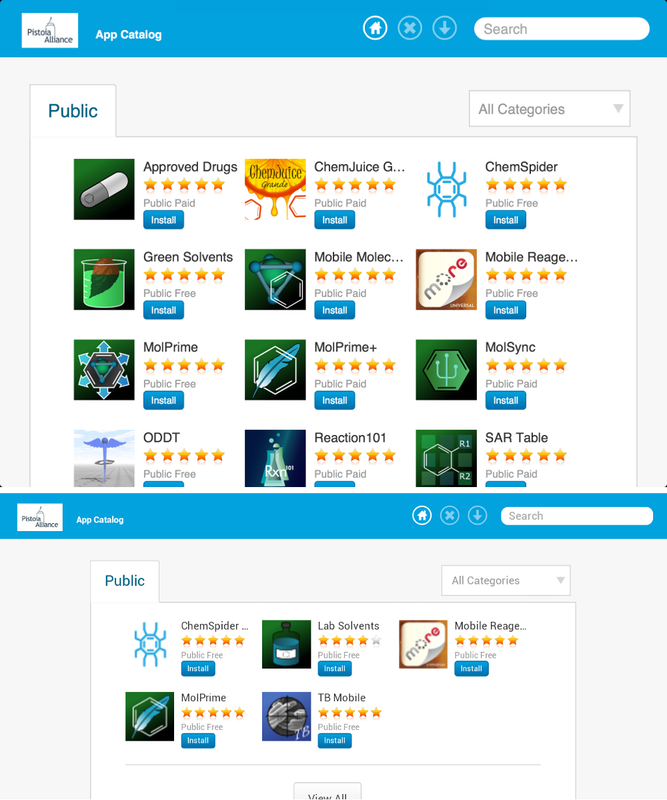 As the AirWatch platform matures, we expect to be able to provide a more advanced forum capability, which will become a key place for scientists and software creators to gather and discuss all things to do with apps in life sciences: what’s great, what’s not great, and what doesn’t exist but really ought to. Further down the line, we are planning to work out a way to actually host apps for deployment, and provide a cloud-based framework for heavy calculations. But first things first: we’re starting with a catalog.